They can do what she can do. They’re like her. Meda might finally have a chance to figure out what she is. The problem? They kind of want to kill her. Before they get the chance Meda is rescued by crusaders, members of an elite group dedicated to wiping out Meda’s kind. This is her chance! Play along with the “good guys” and she’ll figure out what, exactly, her ‘kind’ is. There will be a certain degree of randomness over what I choose to review over the next few weeks but the general idea I’m going with is that, until I’ve read some books in 2014, I’ll be reviewing in accordance with my whims out of the books I read in 2013. I am by no means going to try to catch up on all of the reviews that I was behind because that would make me crazy but there’ll be a few until I read a bit more. Probably the ones that I liked the most or want to mention for some reason. Hence me now talking about Cracked. Not too long ago, I would have told you that I was done with YA fantasy for a while and that I finally thought I was too old to really enjoy it. I’d gotten pretty sick of female main characters falling in love at first sight and giving up everything they cared about to follow their man wherever he might lead, pretty bored of insipid secondary characters and pretty tired of Plain Janes finding out that they had special powers and that they were born to be great. If this one hadn’t have been picked up by Strange Chemistry, I probably wouldn’t have bothered with it, even though I liked the sound of the summary. From what I’ve seen and read, though, Strange Chemistry is becoming a go-to imprint for slightly quirky YA fantasy so I figured I’d give it a go. 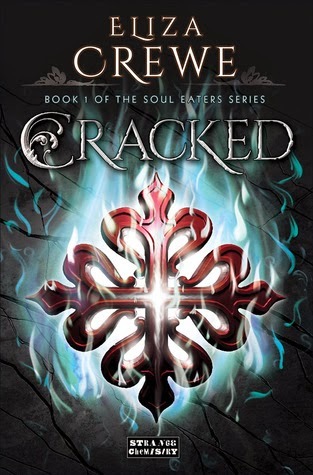 Cracked had everything that I’d been missing from YA fantasy recently. Meda is a soul-eater. For her, though, eating souls isn’t a delicate practice by which some ethereal mist wafts out of her hapless victims in a dignified manner. Those pesky human “outer shells” take some cracking and Meda relishes the messy process of obtaining souls almost as much as she does the process of imbibing them. There’s plenty of gore (the head-squishing, bone-breaking, occasionally unpalatable type of gore) and embracing of her dark side and I loved that, even while she struggled with the thorny moral issue of killing people to eat their essence, Meda was perfectly frank about being a demon and what that means. Add to that her general sarcastic tone/cynical outlook on life and I was won over. There was a moment when the “teenage boy with a hero complex” was introduced where my heart sank. So indoctrinated into the star-crossed lover trope am I that as soon as Chi arrived on the scene, I was convinced that I was heading for that age old “demon girl/boy meets crusader boy/girl and turns life around” tale. And I was completely wrong, thank goodness. There is a touch of romance for those of you that can’t bear the thought of reading a novel without getting that loving feeling but it isn’t necessarily where you might expect to find it and it in no way detracts from the main plot. There are even cross-gender friendships! Girls being friends with boys without getting all smitten, angsty and/or miserable! Who’d have thought? The shift in focus stops the secondary characters from being too one-dimensional and as Meda gets to know Chi, Uri and Jo, it becomes clear that they actually have multi-faceted personalities and stories of their own, rather than just adding to Meda’s story. Not only did Crewe not take her characters’ love lives where I thought she was going to, she also managed to surprise me with her plot twists. There’s plenty of action and I pretty much flew through the book. Crusaders are fighting a life-long battle against demons to protect the general population from their blood-thirsty ways and it isn’t pretty; people die and people’s dark schemes and secrets are outed and it’s just really brilliant. I won’t say too much more for fear of ruining everything about this that is unique but I do whole-heartedly recommend it to the more YA weary among you. Incidentally, it appears that Cracked is the first part of a series and I will be snapping up the sequel as soon as it is released. In the meantime, this does stand well on its own and you can (and should) read this without worrying that you’ll be left with half a story – there are some unanswered questions but nothing too major and no tremendously irritating cliff-hangers. Overall: This really was something fresh and new for me in the YA fantasy genre; a snappy story with a main character that’s neither sickeningly good nor maniacally bad and a romantic sub-plot that really adds something and in no way disrupts the balance of the story. More, please. Source: Received from the publisher via NetGalley – thank you, Strange Chemistry!